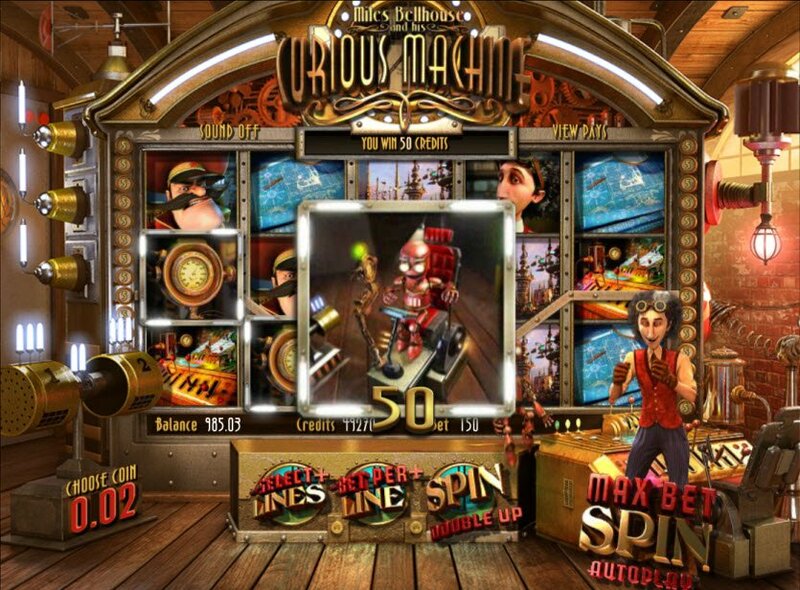 Powered by Betsoft Gaming Software, The Curious Machine Slot Game definitely has a Jules Verne type inspiration which would satisfy those who love Victorian-era or Steampunk genres. Players can bet up to 30 lines for a maximum win while enjoying the beautifully-crafted 3D graphics. Talk about creative! 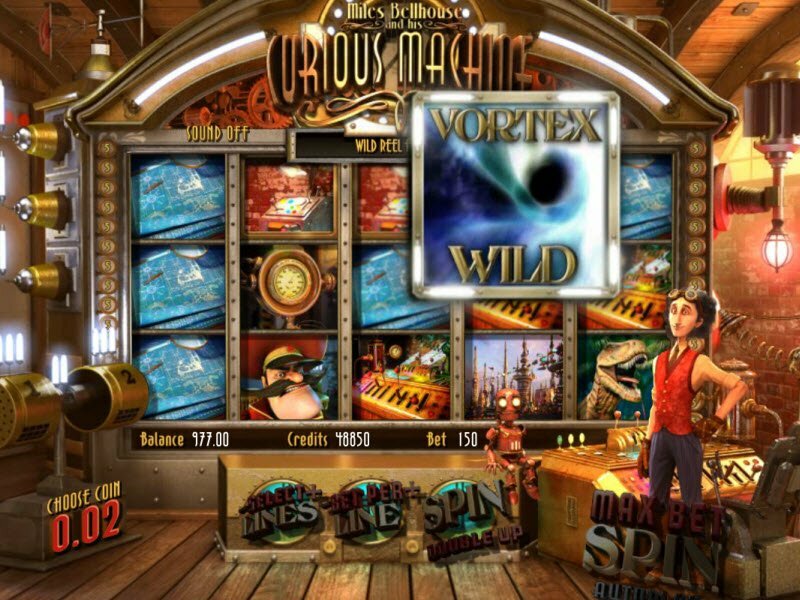 Don’t miss Miles Bellhouse and his Curious Machine slot game. This elaborately designed 5-reel, 30-payline, 3D video slot comes complete with a storyline about an inventor and his lively robot. With crystal clear sound effects of clinking gears and high quality graphics full of cogs, wheels, robots, and steam engines, this game would surely satisfy fans of Jules Verne and the Steampunk genre. It was love at first sight when I first laid eyes on The Curious Machine slot game. I immediately called to mind Jules Vernes’ 10,000 Leagues Under the Sea or Martin Scorsese’s 2011 film, Hugo. Meet Miles Bellhouse, an ingenious, young inventor. Accompanied by his robot Gizmo, he works vigorously in his warehouse to create the most state-of-the-art machines… and the slot machine has very state-of-the-art graphics as well! Spin the reels full of gears, robots, blueprints, and other curious machines from Mr. Bellhouse’s workshop. With luck you might even travel in time or win big payouts! Meet Miles Bellhouse, an ingenious, young inventor. Accompanied by his robot Gizmo, he works vigorously in his warehouse to create the most state-of-the-art machines… and the slot machine has very state-of-the-art graphics as well! As though the amazing 3D graphics weren’t enough, The Curious Machine slot game comes packed with really unique and futuristic bonus features. Get 3 or more of the Travel Through Time Symbols scattered anywhere on the reels to trigger the Travel Through Time Bonus. When the general peeps inside, join Miles and his robot companion as they flee his prying eyes and travel in time. The Vortex Symbol represents the Wild. When no wins occur on the reels and a Vortex Symbol appears, the Vortex will activate. The Vortex spins any icons it touches, allowing for a new layout of symbols with a new chance for wins. The Reel Rewind feature gives you a Second Chance to win. The Reel Rewind randomly triggers when no wins occur on the reels. One of the five reels may randomly rewind, giving you a second chance at a win. 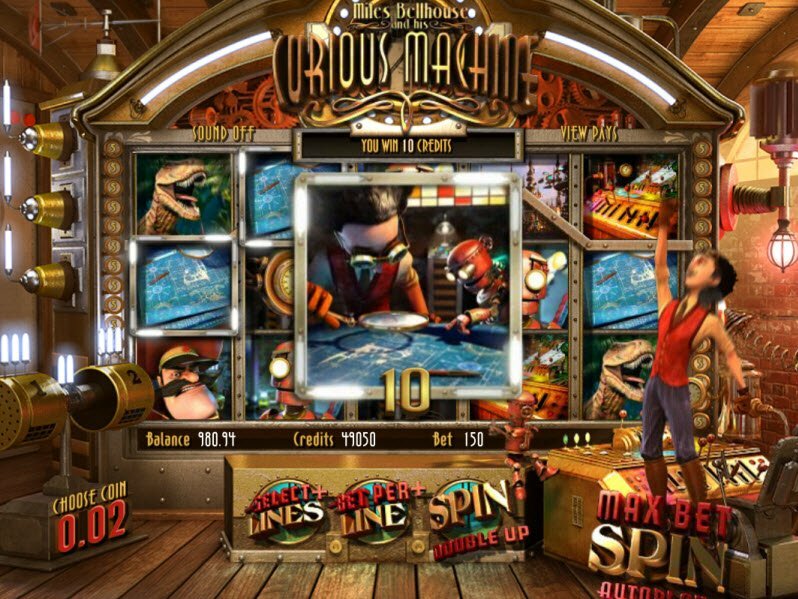 In the Blast to the Past Curious Machine bonus, players receive three or more dinosaur symbols scattered anywhere on the reels to trigger the Free Spins feature. Go back in time to the land of the lost and earn bonus credits. Each time the reels spin, a random multiplier will activate. After any winning combination, players can choose to Double Up. During this mini-game, you try to guess which of the robot’s hands contains the coin.